Alexandria, Pineville and several surrounding nearby towns have a variety of attractions and things to do. From museums and zoos, to outdoor recreation and historical sites, there is something to do for area residents, and visitors alike! Completed in 1800, Kent Plantation House is the oldest standing structure in Central Louisiana. The Creole house and period outbuildings depict plantation life between 1795 and 1855. Open-hearth cooking and other special presentations are offered periodically and seasonal. Guided tours are available. Admission is charged. Phone 318.487.5998 for opening hours and schedule of events. The house is located at 3601 Bayou Rapides Road in Alexandria. 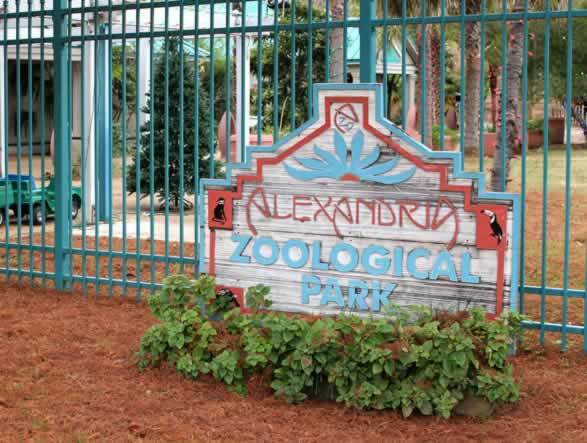 The Alexandria Zoological Park is a 33-acre zoo, first opened in 1926. It is home to about 500 animals, and is accredited by the Association of Zoos and Aquariums (AZA). It is one of only approximately 200 accredited zoos in the U.S., Canada, and Bermuda. The Zoo is one of only 20 in the world to house Malayan tigers, one of 10 zoos in North America to exhibit lowland anoa, and the only AZA facility in North America to exhibit two white-tailed sea eagles. Main zoo areas include Festival Plaza, the Australian Walkabout, Asian Area, Louisana Habitat, Land of the Jaguar, the African Experience, and an education center. It also features a train, the Bayou Le Zoo Choo Choo, a scale model of a C.P. Huntington steam engine. The zoo grounds also house the Palm Cafe at Festival Plaza, and a gift shop. The zoo is located at 3016 Masonic Drive in the Alexandria City Park. An admission fee is charged. The History Channel announced in December of 2011 a new television series to take place in Alexandria, Louisiana. "Cajun Pawn Stars" will feature Alexandria's Silver Dollar Pawn & Jewelry Center, and its owner Jimmie DeRamus and his family-owned business. Silver Dollar Pawn Shop is one of the largest pawn shops in the South. The 20,000-square-foot store houses more than 100,000 items, and is an attraction for school and tourist bus tours. The main room alone displays more than 43,000 items of inventory. Among the more popular items are Hollywood memorabilia, autographs, old coins, collectible firearms, antiques, and of course jewelry. Silver Dollar Pawn Shop's address in Alexandria is 2417 Lee Street, at its intersection with Masonic Drive near Alexandria City Park, and across the street from Fire Station Number Four. It is just a few blocks from Alexandria's famous Hokus Pokus Liquor store and its iconic neon sign. Silver Dollar can be found on the web at http://silverdollar-alexandria.com and reached at telephone number 318.487.6005, or toll-free 888.945.3168. Designed by Mr. Jim Lipe, one of the premier golf course architects in the country, OakWing Golf Club offers 18 holes of "Championship golf with first-class clubhouse and practice facilites. OakWing Golf Club, which opened in September 2002, offers a unique design interwoven throughout its beautiful England Air Force Base location. This 7,043-yard, links-style course blends the natural beauty of Louisiana bayous, lakes and towering treelined fairways with the challenge of rolling hills and undulating greens. It is part of the Audubon Golf Trail. Open to the public seven days a week, OakWing is conveniently located just 1 mile off of Interstate 49 at the site of the former England Air Force Base. Phone 318.561.0260 for more information.